Facebook has rolled out a minor update to its Android app, adding support for Facebook Deals. In order to see coupons and other offers from local businesses, you’ll have to check-in using the Facebook Places feature. For instance, if you check-in to a coffee shop, you may get a coupon for a discount or freebie on your next order. I just took the new app for a spin and tried checking into one of the places within range. Either the app could tell I wasn’t actually at the coffee shop around the corner, but was instead working from my home office, or there were no deals available. either way, it looks like you’ll have to actually use the Places feature regularly to access the Deals. You can’t just scroll through a list of available deals and start checking in willy nilly. I suppose that’s good for the participating businesses. Facebook says the new app also includes some bug fixes. Facebook Deals are already available in the company’s iPhone app. 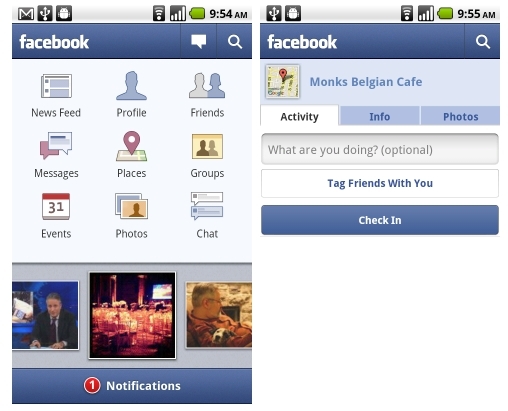 The Facebook for Android app is available as a free download from the Android Market. It also comes preloaded on most Android handsets, so if you have automatic updates turned on (only available with Android 2.2 and up), you may already have the new version.